In 1966 Mercedes Benz started using Air Flow Controlled Fuel Injection systems. before that most fuel injection systems had been mechanical in nature. With the invention of Electronic fuel injection you had an Electronic Control Unit. The original Electronic Control unit or ECU, (almost everything in the automotive world has an abbreviation). The ECU receives signals from about seven sensors, (varies by model) and uses these inputs to decide only two things. You read that right. Fuel injection is not rocket science. We are not sending people to the moon with your ECU. You hear a lot of mechanics tell you that there are dozens of sensors for fuel injection. The reality is that fuel injection really only gets about seven inputs and has only two outputs, (injector millisecond on time and ignition timing). Though only a few cars cars and trucks on the road still use the ECM system and Hendersonville Muffler Company can repair your ECM diagnosis and repairs. 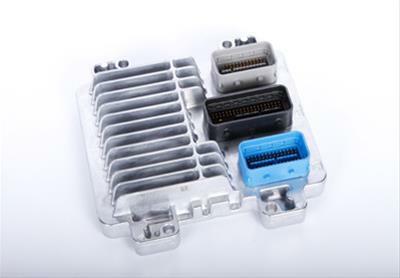 After a few years the Electronic Control unit evolved into the ECM (Engine Control Module), Engine Control Management meant that the ECM was still seeing those same seven sensors but also began to get input signals from a few transmission sensors. With these extra inputs the ECM could now do a better job of sensing the load that the car was going through. A little more complex than the original systems but still not sending anyone to the moon. The ECM generally communicates with the TCM or Transmission Control Module to decide when the transmission should shift down or up and keep the engine in the peak torque range. The ECM also began communicating with the body control module to see what the driver was doing. (The engine needs to react when you turn the A/C on, turn the steering wheel, turn on the headlights, etc.) Many cars and trucks on the road still use the ECM system and Hendersonville Muffler Company can repair your ECM diagnosis and repairs. Finally the manufacturers started incorporating the ECM and TCM into one unit called the PCM. The PCM gets inputs from the engine, the transmission, the wheel speed sensors, the air conditioner and power steering pressure sensors, the Body Control Module, and suspension sensors, (some models). The PCM controls everything from one module. When you give the car or truck full throttle the PCM turns the air conditioner clutch off for a second or two. The PCM also turns off the charging system for a second in order to give the engine more power. Since Electronic Control Modules have been around for over 50 years the manufacturers have gotten pretty good at it. Despite the fact the manufacturers have had a lot of practice we still get electronic problems in our shop every day. When you do have problems Hendersonville Muffler Company can repair your PCM and ECM diagnosis and repairs.